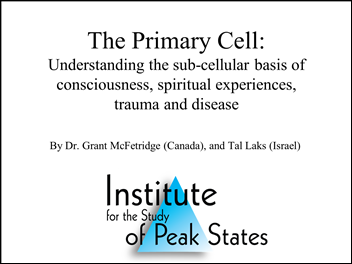 Below is a brief summary of some of the biological basis for peak states. 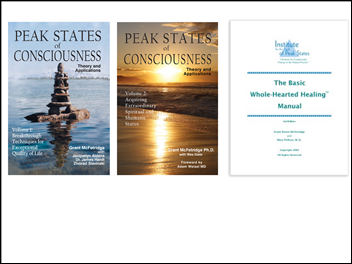 For more detail, Volume 1 of Peak States of Consciousness: Breakthrough Techniques for Exceptional Quality of Life introduces the paradigm for the layperson; and Volume 2, Peak States of Consciousness: Acquiring Extraordinary Spiritual And Shamanic States written for our therapists, covers other fundamental breakthroughs and goes into great detail. The paper called “Spiritual Emergency and the Triune Brain" located on this website also covers some of the material, as does our The Basic Whole-Hearted Healing Manual (3rd edition). For a description of the new paradigm that our work has generated, go to the Paradigm Violations, or "101 Reasons Why This Can't Be True". In Volume 1 of Peak States of Consciousness, we introduced the ‘developmental events model for peak states, abilities, and experiences’. Simply stated, the model says that all peak states, abilities, and experiences are acquired during key events in our development as a sperm, egg, zygote, fetus, and baby. The states are gained when the growing, developing organism becomes complex enough to incorporate them. If there was trauma at these events, later on in life when we move towards having these states, the associated pain gets triggered and we move away from the states, automatically and generally without conscious awareness. It’s very much like teaching a rat to avoid areas of their cage that induce an electric shock. If these and related events are experienced with mild trauma, these states (and abilities) will come and go during our lifetime, depending on outside circumstances and our use of spiritual or shamanic practices. If these key events are experienced with extreme trauma, it becomes nearly impossible to access these states no matter what techniques or circumstances we use or encounter. 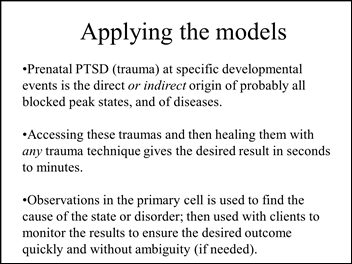 The model implies that any particular state can be restored by healing the trauma that occurred during the key (and related) developmental events. This actually works for most people, making us quite confident of our model. 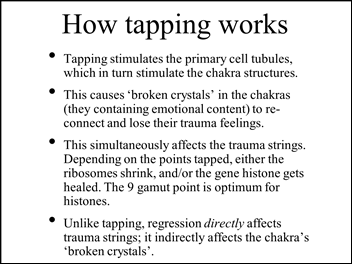 Note, however, that implementing this idea requires very effective trauma healing techniques, a map of relevant developmental events and a way to get to the traumas. The volumes in this series define the key developmental events that we know of, methods for accessing these events, and a variety of healing modalities. This model is a significant departure from just about all existing models and methods for understanding and acquiring peak states. First of all, our model says that peak states are our birthright, and should be present in us from birth. 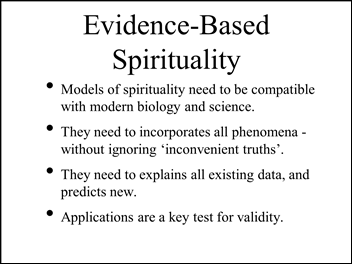 Secondly, our model includes not just states that our cultural conditioning is comfortable with, such as the Underlying Happiness state, but also all spiritual and shamanic states as well! These latter states are also acquired at key developmental events, just like the other, more conventionally recognized states. One of the most surprising results of our work with pre-birth regression was the observation that the fetus, sperm, and egg had virtually all possible peak states. 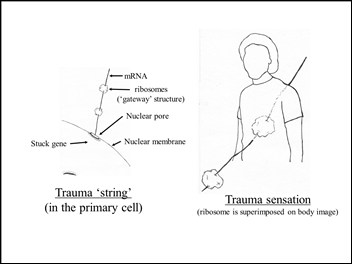 Even if trauma occurred in key developmental moments (such as conception, implantation, and so on), the developing organism, for the most part, kept its states until birth. In some cases, the organism doesn't have the state fully, or can actually lose a state, but for most clients this model of having all (that we know of) peak states is accurate. 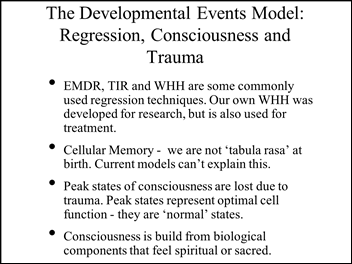 This is why sperm, egg, or fetal consciousness feels so different to most people during regression - they're experiencing themselves with their peak states relatively intact, giving them sensations that they don't recognize in their adult lives. 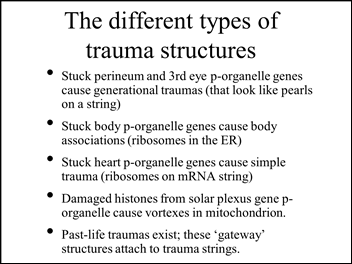 The presence of peak states in the fetus (and sperm and egg) explains why pre-birth trauma only takes place if the organism is injured, unlike trauma that occurs after birth. 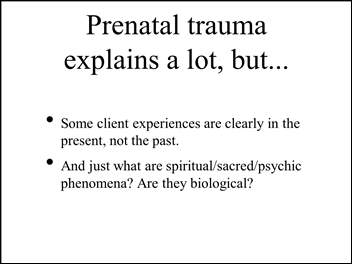 This fact is not widely known even in the pre- and perinatal trauma field, and explains why therapists sometimes don't succeed in eliminating emotional content during pre-birth trauma. They don't realize that the emotions are held in place by injury. This lack of understanding is compounded by the client's automatic defenses, as they often suppress any awareness of injury unless guided to look for it. Hence, both client and therapist remain baffled as to why the trauma isn't fully healing. Our colleagues that can recall their fetal experiences at will all report that their peak states are lost during the birth experience. 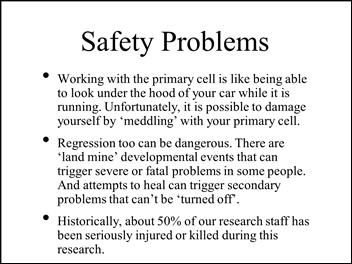 This also matches the data from thousands of trauma regressions that we've done. This occurs because the previously dormant effects of trauma (associated with key developmental events) gets 'turned on' at birth. This in turn causes the body to block peak states, experiences, and abilities to avoid the pain of the associated traumas. When we heal early developmental trauma and a client suddenly experiences a peak state, we often say that they have 'acquired' the state. Obviously, our model says that isn't true - the state was really acquired at pre-birth developmental stages. Instead, all they have done is unblocked the state and restored themselves to what they once had. Thus, we should really use words like 'restore' or 'unblock' when referring to our peak states processes. However, most clients would not understand what we mean - to them, it feels like they've acquired something out of nowhere. Thus, in these textbooks I'll often use the word 'acquire' so I can discuss the ideas with people who don't know our model. Let’s look in more depth at the part of the model that was only briefly mentioned in Volume 1 - that of peak abilities. Like peak states, peak abilities are a consequence of having particular developmental events occur without trauma. Some peak states automatically give characteristic, unusual ability or abilities. An example of this can be found in this volume in the chapter on Spaciousness. It is also possible to restore some peak abilities without a peak state. We access these abilities by surrounding ourselves in the present with the sensations we had during their key developmental moment. Most people who have natural peak abilities are not aware that they do this. We have our students acquire these abilities using regression to key events, and healing any trauma there. Afterwards, they can turn these abilities on and off by deliberately choosing to feel the sensations from the corresponding developmental event in the past. In the ‘60s, Dr. Abraham Maslow defined the concept of ‘peak experiences’. His definition primarily described a variety of temporary (“unstable”) peak states. Over the years, people have also used the same label to describe temporary, unusual experiences that are not brief peak states, but are rather a whole range of unusual experiences. 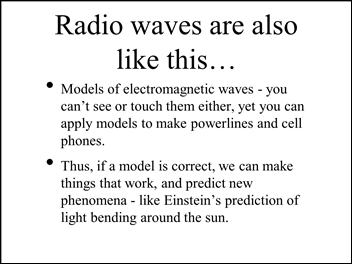 This can be a bit confusing as the same words are used for two very different types of phenomena. Unfortunately, one has to look at context to determine which type of peak experience is being referred to. In this section, I’m going to look at peak experiences that are not temporary peak states. Applying the developmental model to this latter type of peak experiences is particularly fascinating. One can regress to particular key events in development and, instead of just reliving the biological events at those moments, a variety of other types of experiences can occur. For example, there is a moment in time, shortly after birth, when one is filled with the sensation of ‘truth’. A much more radical set of developmental events exists. 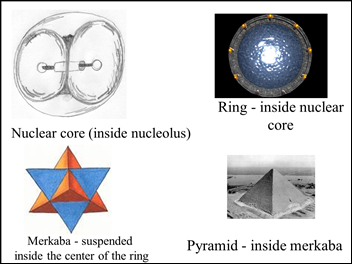 These act as a ‘gateway’ to another realm of existence or time. When one regresses to these moments in one's past, one finds oneself suddenly in a completely different reality, simultaneous with that early biological moment. An example of this was given in Volume 1, where it is possible to access the realm of the archetypes. Another is the ‘Humanity Disc’ covered in the chapter on good or evil. An appendix in this book lists the ones we’ve currently identified, but there are many more. These gateway experiences are the same for everyone, and don't just trigger some sort of general access to the non-physical. Definition - ‘Gateway developmental event’ A ‘gateway event’ is a particular developmental event that, when relived, gives access to a particular experience in other realities, or to other non-physical experiences. 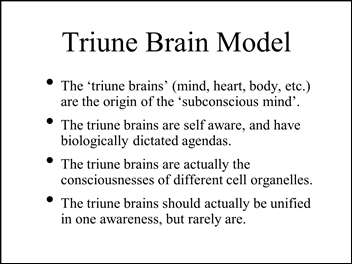 In average people, the individual triune brain awarenesses are to one degree or another separate from each other. 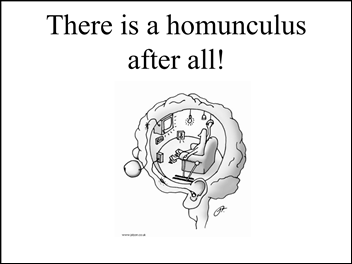 The brain awarenesses can give up their individual identities and merge or fuse together to form single awarenesses. The different possible ways that the brains can 'merge' results in different peak states with distinctly different experiential characteristics. The Happiness, Inner Peace, Hollow, and Wholeness states are examples of different brain awareness combinations. As a group, we call these states 'triune brain fusion states'. Perry diagrams can be used to show the different ways and amounts that the awarenesses are merging. 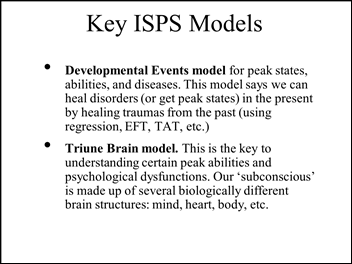 These diagrams allow clinicians to identity the types and degrees of the triune brain states a client has, in order to keep track of progress in fully acquiring the endpoint states, Hollow and Wholeness. Volume 1 goes into these states in great detail. One of the most surprising discoveries we've yet made came out of our investigation into understanding the experience of trauma. 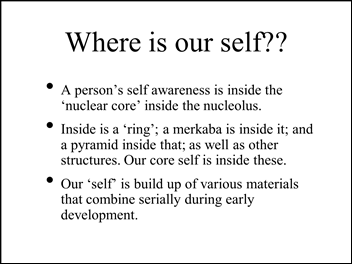 We found that people actually have a dual awareness: they perceive themselves as a body in the physical world, and simultaneously inside the environment of a single cell in their body. 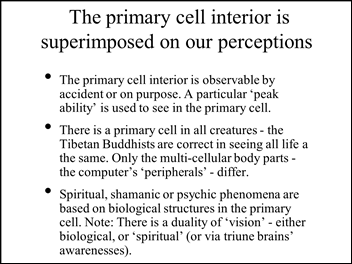 This particular cell is unique; consciousness itself originates inside that one cell, and not, as we had supposed, as an outgrowth of cellular brain complexity. 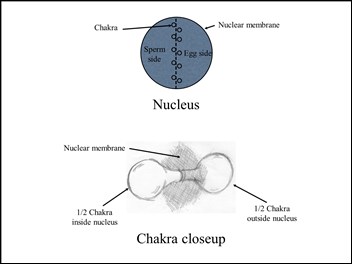 We call this cell the 'primary cell'. 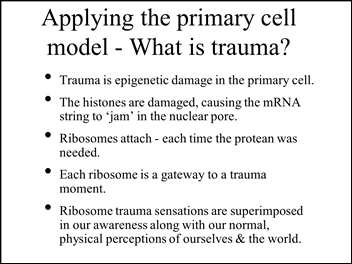 Our awareness of problems inside the primary cell is superimposes onto our body experience and is what leads to the sensations of trauma, many physical symptoms, and many spiritual and 'psychic' experiences. This discovery has tremendous importance to both the field of physical and psychological healing, and to the recovery of peak states. 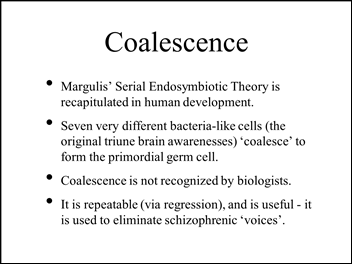 One can observe (with certain states of consciousness) structural features inside the primary cell that are causal for psychological and physical disorders, as well as for exceptional states of consciousness. Biologically, the feelings and sensations of a peak state correspond to optimum functioning of a metabolic pathway inside the cell. Thus, optimum experiential functioning (a peak state) corresponds to optimal subcellular biological functioning (a metabolic pathway). To summarize, the developmental events model involves the past. 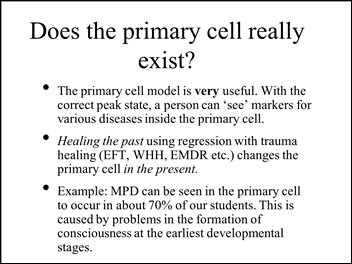 The primary cell model involves the present. 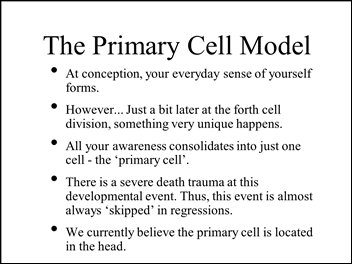 The two models are linked by time and causality, i.e., what happened in the past creates what is happening in the present inside the primary cell. Association for Pre- and Perinatal Psychology and Health, www.birthpsychology.com. Excellent material on the topic of in utero regression. 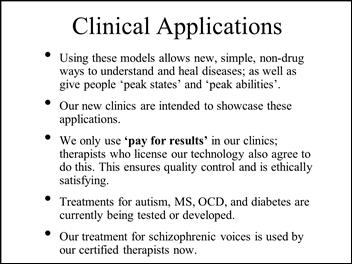 "Early Trauma Treatment and Trainings" by Terry Larimore, www.terrylarimore.com. Her website also contains excellent material. Emerson Training seminars, William Emerson, www.emersonbirthrx.com. He is one of the leaders in pre- and perinatal psychology in my opinion. Michael Gabriel and Marie Gabriel, Voices from the Womb: Adults Relive their Pre-birth Experiences - a Hypnotherapist's Compelling Account, Aslan Publishing, 1992. Stanislav Grof, The Adventure of Self-Discovery, State University of New York Press, 1988. Excellent coverage on the stages of birth and other spiritual and shamanic experiences. See www.holotropicbreathwork.com. Sheila Linn, William Emerson, Dennis Linn, and Matthew Linn, Remembering our Home: Healing Hurts and Receiving Gifts from Conception to Birth, Paulist Press, 1999. Elizabeth Noble, Primal Connections: How our Experiences from Conception to Birth Influence our Emotions, Behavior, and Health, Simon and Schuster, 1993. 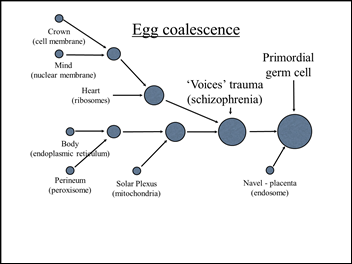 Bill Swartley, "Major Categories of Early Psychosomatic Traumas: From Conception to the End of the First Hour" from The Primal Psychotherapy Page. An online copy is at www.primal-page.com/bills-1.htm. Excellent with great references. Dr. Grant McFetidge, Peak States of Consciousness, Volume 2, 2008. 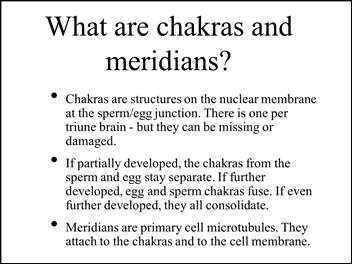 Karla McLaren, Your Aura and Your Chakras: The Owner's Manual, Weiser Books, 1998. 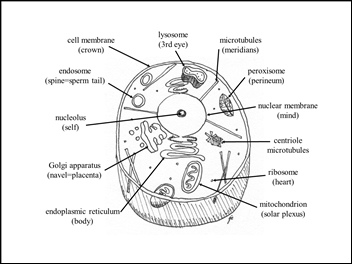 1.3 Nov 19, 2014: Deleted and moved text to another webpage on 'Cell organelles and the triune brain'. 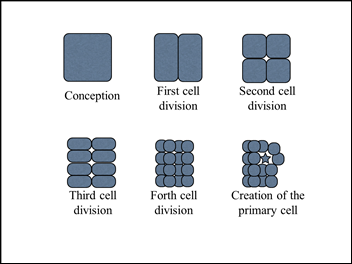 1.2 Oct 13, 2011: Added a section on the primary cell. Added a YouTube video about prenatal trauma and its impacts.